The meandering waters of the Volga capture the rich cultural history of Russia, from its Mongol Buddhist era to its European renaissance and after. If all you know about Europe’s largest river are the cities of Volgograd and Kazan, prepare to be surprised. Take a barge ride down the central and southern basin of the Volga and discover the gems that lie hidden from common view; from the only Buddhist colony in the European continent to a uniquely 18th century vintage German colony with its distinct citizenry and architecture. Besides well-known tourist destinations such as Volgograd and Kazan, the central and southern basin of Europe’s greatest river hides some little-known gems that bear witness to Russia’s astounding cultural variety. RIR has selected three that are worth a visit if traveling in the region. Elista is located just around 1200 kilometres from Moscow, in the midst of the steppe that separates the Volga basin from the Caucasus and the Black Sea coast. But it is a whole world apart. 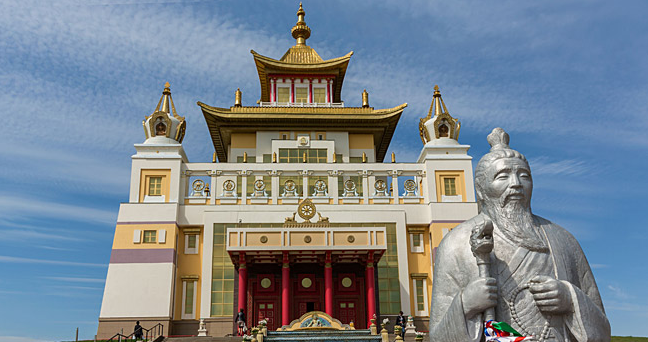 The tiny capital of the Republic of Kalmykia is unique as the only place in Europe where Tibetan Buddhism is practiced; a small piece of Mongolia transplanted inside European Russia. The local people, known as Kalmyks, practice Tibetan Buddhism, worshipping in distinct shrines reminiscent of Lhasa’s ‘Potala’ palace. The Kalmyks were a group of nomadic tribes that moved from Mongolia to this region in the early 17th century, and were integrated into the Russian Empire. During the Soviet era, they were granted the status of an autonomous republic. However, the community suffered huge reverses during the time of the great Patriotic war against fascism, with tens of thousands of Kalmyks being deported en masse to Siberia and Central Asia (in 1943) by decree of the Soviet government. The forced move disrupted Kalmyk society and caused immense suffering to tens of thousands of people. They were allowed to return only in 1957. You can learn about this and more at the N.N. Palmov National Museum of the Republic of Kalmykia. Since 1991 the Kalmyks have revalorized their cultural and religious heritage, especially visible architecturally. In Elista’s Lenin Square a statue of the Bolshevik leader in a meditative pose faces the Tibetan-style Pagoda of the Seven Days, which sets the tone for the whole town: even some bus stops take the form of small pagodas. A stroll through downtown Elista centered around ul. Lenina, would ideally start from the nearby Alleya Geroyev, a pleasant park dotted with references to Tibetan Buddhism (such as the Golden Gate and the Shakyamuni Buddha Pergola) and to pre-Buddhist Kalmyk mythology (the statue of the White Old Man). There is also a World War II memorial with a monument to Basan Gorodovikov, the Kalmyk Soviet Army general that led their return home in 1957. After tasting a cup of “dzhomba” (Kalmyk tea), head to the imposing and lavishly decorated Golden Temple of Shakyamuni Buddha (popularly known as the New Khurul), the biggest Buddhist temple in Europe, which was inaugurated in 2005. A much smaller, but no less impressive sight, is the Sacred Abode of the Gulug School of Theory and Practice (the Old Khurul), a Buddhist monastic complex built in 1996 and located in the middle of the steppe. To reach it, take minibus 15 at the crossroads of ul. Pushkina and ul. Gorkogo, next to the “Ice” canteen. Chess City, built in 1998 to host the 33rd Chess Olympiad, is also worth a visit. To get there, take minibus 7 from ul. Lenina in front of the Elista Hotel. Present-day Krasnoarmeysk, a noisy suburb of Volgograd, hides an astounding historical treasure: the remnants of the German colony of Old Sarepta. Surrounded by modern high-rise blocks of flats, the remnants of this 18th-century settlement are spread around a small square with a well-kept garden and guarded by the clocktower of a nearby Protestant Church. The simple, but elegant country houses represent a slice of 18th-century rural Germany transplanted in Russia and today comprise the Old Sarepta Ethnographical Museum complex. Sarepta was founded in 1765 by a group of German missionaries of the Moravian Church that came to Russia following Catherine II’s 1763 manifesto granting land and privileges to foreign colonists to settle down in Russia. Their aim was to spread Christianity among the Kalmyks. They didn’t succeed, but nonetheless proved to be good craftsmen, farmers and producers of handicrafts, wine, beer, tobacco and mustard. Renamed Krasnoarmeysk in Soviet times, Sarepta was hit hard by anti-religious campaigns. The community came to an abrupt end in 1941 when the Soviet government deported all Volga Germans to Siberia and Kazakhstan. The colony’s surviving buildings became a museum complex in 1989. There is a permanent exhibition on the history of the Volga Germans, you can visit their church, learn about how they produced wine, beer and mustard and see the interiors of a late 19th-century pharmacy and apartment. The complex also hosts temporary exhibitions, cultural events and has a library. Open Tuesday-Sunday from 09:00-17.30. Book excursions in advance (tel. 8442 673302). Today Shiryaevo is a good place for taking a break from city life. Besides admiring the old alleyways of town and walking through the beautiful mountain landscapes, you can also rent a bike.